Our new high pressure fittings permit direct connection of 360 micron OD fused silica, PEEK, stainless, or electroformed nickel tubing without the use of liners. The ferrule snaps into the nut so that the fitting is "one-piece", but the ferrule remains free to rotate as the nut is tightened so that the tube doesn't twist. 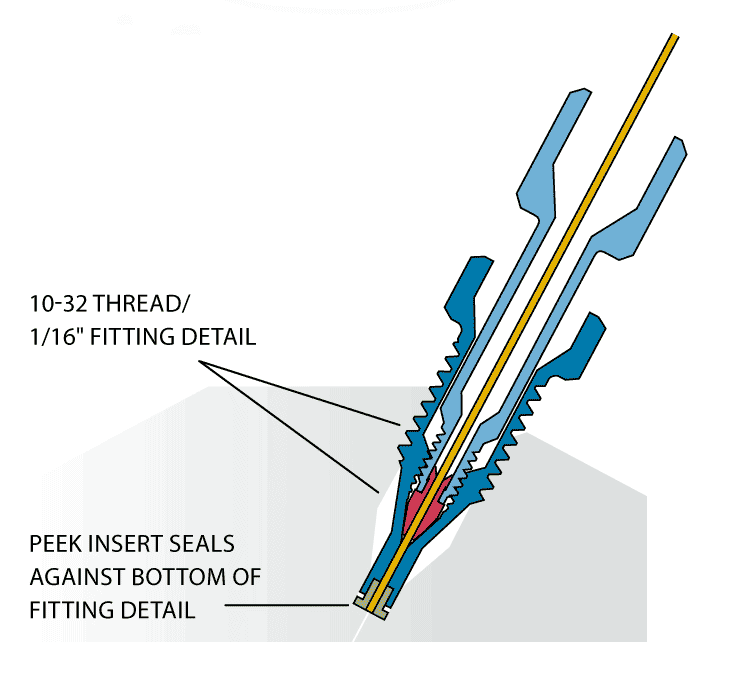 Because of the compact size and fine 2-56 threads, a leak-free connection that seals at pressures in excess of 20,000 psi can be easily formed with the available manual tool. 360 µm fittings are dedicated for use with either fused silica, metal, or PEEK tubing; components cannot be mixed or used with a different tubing material. 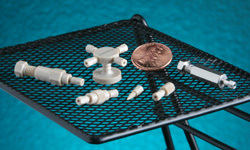 Tees and crosses for PEEK or FS tubing offer a choice of three bore sizes, and feature a "quick mount" base with adhesive backing to make sure that the fitting is stable and fragile tubing doesn't get broken. There is also a quick-mount PEEK union. Internal reducers are available to connect 360 micron tubing to 1/32" or 1/16" fitting details. Our manual tightening tool is recommended for installing 360 micron fittings, which are easily overtightened when a standard wrench is used. Our new fitting connects a 360 µm FS tube directly into a 1/16" fitting detail, with the bore of the FS tube precisely aligning with the bore of the valve.